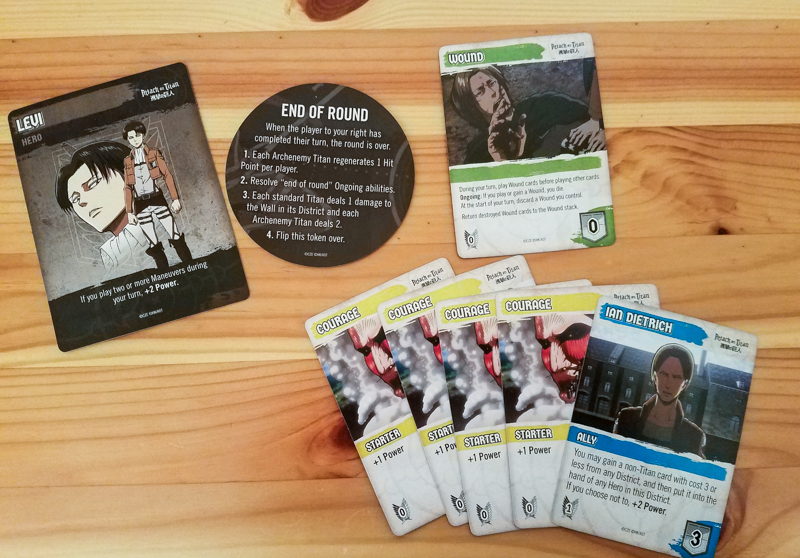 This Attack on Titan: Deck-Building Game review was made after playing the game four times. 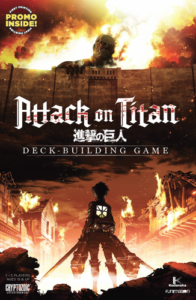 What is Attack on Titan: Deck-Building Game? 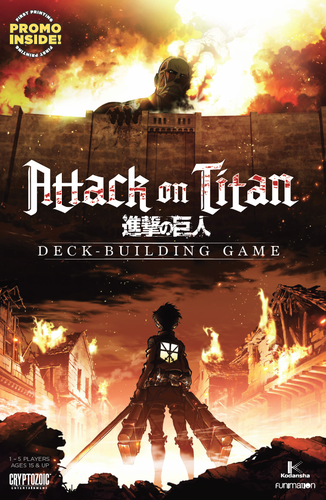 Attack on Titan: Deck-Building Game is a co-op deck building game based on the very popular anime. Your job is to acquire the gear and abilities you need so you can defeat the titans that are attempting to get through your city’s walls. Attack on Titan was designed by Matt Hyra and is published by Cryptozoic Entertainment. 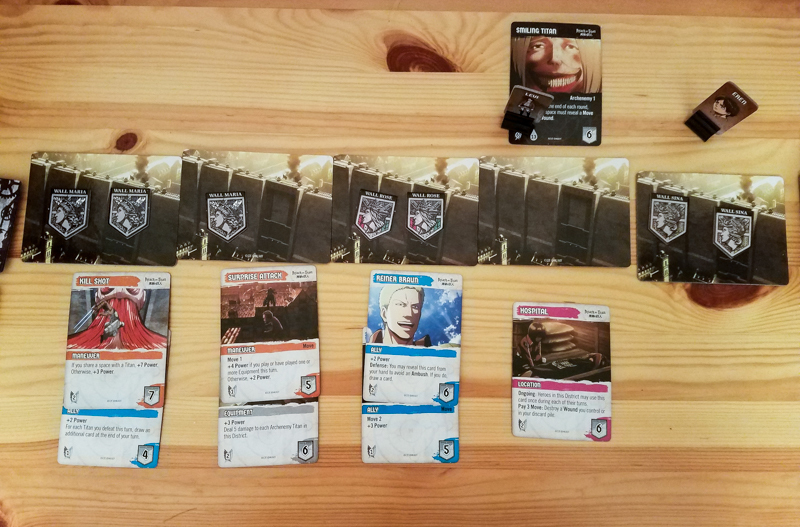 As is the case with most other deck building games out there, in Attack on Titan each player is going to start out with some basic cards and then build up their decks as the game progresses. Players will start out with seven +1 Power cards (called “Courage”) and three Move 2 cards (“Thrust”). Power is used to buy new cards and to fight the titans that show up, and the Move cards allow you to move around the city. Throughout the game you’ll be using the cards in your hand to purchase better cards inside the city’s walls while also going outside the walls to deal with the titans. When buying a card, you simply pay the amount of power shown on the card and then put that new card in your discard pile. You can also use cards to activate your character’s special ability. Most of the cards simply give you additional power or movement, but there are some that give you or other players special abilities. Some Maneuver cards give you huge power boosts if you’re in the same space as a titan. Locations allow you to place the cards on a wall to give players there some cool abilities. There are also cards with the “Defense” keyword, which allows you block some would-be negative effects. The titans will usually have an Ambush ability, which means they will do some type of damage when they come in play, or they might have an ongoing effect. When fighting a normal (red) titan, you’ll pay the power cost shown on the titan’s card to defeat them. The four bosses, called Archenemy Titans, are a lot tougher because you’ll have to get through their hit points, then pay the Power cost like with normal titans, and then draw a Titans on Attack card to see if they canceled any of your cards. Each of the five walls starts out with two tiles that represent their health. If both of a wall’s tiles are removed, that wall is destroyed. The titans will attempt to do damage to the walls at the end of each round, but the characters can usually block the damage by taking Wound cards. This is one of the ways that the characters protect the city, but they can die if they ever have one or more wounds on the table in front of them and either gain a new wound or have to play one. You’ll win the game if you’re able to defeat all four of the Archenemy Titans. There are three ways to lose: all of the walls are destroyed, the main deck of cards is depleted, or if a certain number of heroes die (based on player count). I really like how the titans go outside the walls and the purchasable cards go inside the walls. It’s thematic and it allows players to clearly see who they’re fighting and what they can buy. Another cool thing about this game is that the players get to choose who goes first each round. This is great because it encourages everyone to communicate and to develop a game plan for the round. This is an extremely easy game to learn. All you really have to know is how to move around the city and that Power can be used both to fight the titans and to buy new cards. Newcomers to deck builders shouldn’t have any problems learning how to play this game. There are multiple variants in the rulebook, so people who end up liking the game have plenty of ways to adjust the difficulty… and there are even solo rules. Easily my least favorite thing about this game is that you can draw dead hands. You might have a great collection of power cards in your hand that would allow you to kill any titan you want or buy an amazing card, but that won’t matter if you’re stuck somewhere with no movement cards. This happened multiple times in every game I played and it was definitely frustrating. I wish there were more exciting / satisfying moments in this game. The Attack on Titan anime has some really epic fight scenes and you never get that “epic” feeling while fighting these titans. It lacks that exciting buildup that you’ll find in many other co-op deck builders. The standard game is just too long, especially if you are talking to your teammates about how you should approach each round (which you should). Each game I’ve played has taken over two hours, which is about two times too long for this type of game. Unfortunately, no one in my group had a lot of fun playing Attack on Titan: Deck-Building Game. I should point out that we LOVE deck builders and play a lot of them, so maybe we weren’t the best audience for this one. I have a feeling that fans of the anime who are new to modern board games would get a kick out of it since the theme is there and it’s an easy game to learn. Now, for everyone else, there are some co-op deck builders I’d recommend over this one. If you’re looking for a lighter game with a well-known IP, I’d go with Harry Potter: Hogwarts Battle. If you simply want the best cooperative deck building game out there, most of the people in my group would say it’s Aeon’s End. 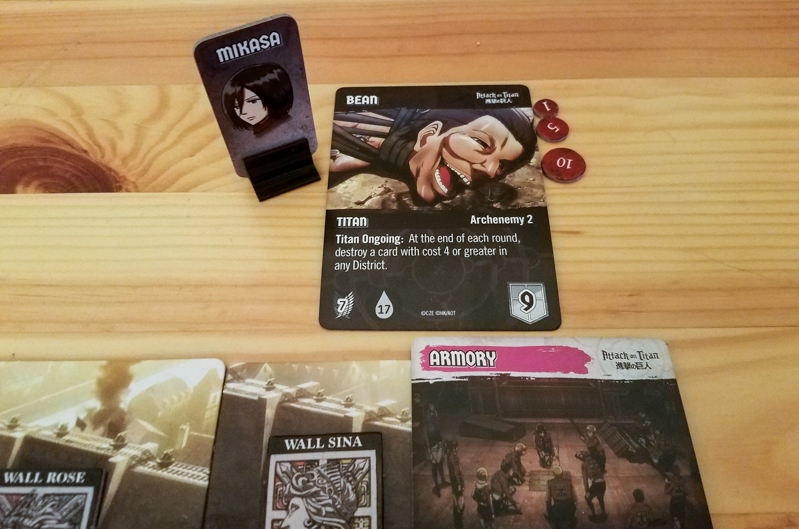 Thanks for taking the time to read our Attack on Titan: Deck-Building Game review! To stay updated on all things cooperative board games, follow us on Twitter, Facebook, or via RSS.